SPIKE is a very special custom built yacht launched by Tecnomar in 2008, the only Velvet 90 model ever built. Powered by twin MTU 16V 2000 M91 main engines linked to Arneson surface drive propellers, she can cruise at 35 knots and reach a maximum speed of 40 knots. She can also accommodate 6 guests in 3 cabins (Master, VIP + Twin) and 3 crew in 2 cabins. With a large aft deck as well as sun pads forward plus a large swim platform with tender storage, SPIKE offers a lot to a potential buyer: speed, style and space. Still in original ownership, SPIKE has very low engine hours (approximately 210) and is in immaculate condition having been stored ashore in a hangar each winter. The owner could consider a part exchange with a 50 foot. Berth in La Spezia for sale through a separate deal. United Yacht Sales New Jersey would love to guide you through a personal showing of this 88' Tecnomar Velvet 90 2008. 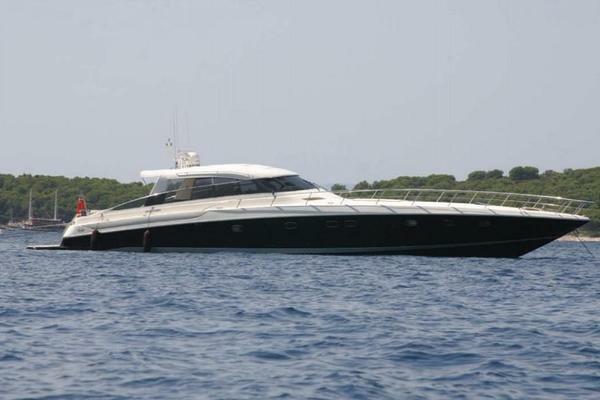 This yacht for sale is located in La Spezia Italy and priced at $1,390,000. For a showing please contact us by filling out the form on this page and we will get back to you shortly!